Caspar van Wittel (1653-1736) was born in Amersfoort, left around 1673 for Italy, earned a good reputation for himself there and never returned to the Netherlands. Today, the vast majority of his works are in collections in Italy, England and Spain. With the exhibition 'MAESTRO VAN WITTEL – Dutch master of the Italian cityscape', Museum Flehite and Kunsthal KAdE honour this master, who is virtually unknown in the Netherlands, with a major retrospective. Kunsthal KAdE and Museum Flehite introduce the Netherlands to a world-renowned Dutch master who remained largely unknown in his country of birth, the Netherlands. Caspar Adriaensz. van Wittel (1653-1736), also known as Gaspare Vanvitelli, became famous and revered in his adopted homeland of Italy. During the 17th and 18th century, he painted Rome, Naples and Venice in minute detail, influencing famous Italian cityscape painters such as Canaletto and Bellotto. Van Wittel was born in Amersfoort, left around 1673 for Italy, earned a good reputation for himself there and never returned to the Netherlands. Today, the vast majority of his works are in collections in Italy, England and Spain. In the Netherlands, there are only a few drawings and a single gouache: View of Amersfoort in Museum Flehite. With the exhibition MAESTRO VAN WITTEL – Dutch master of the Italian cityscape, Museum Flehite and Kunsthal KAdE honour this master with a major retrospective from 26 January through 5 May 2019. It puts his extensive oeuvre in the context of his Dutch learning period and his influence on the later Italian vedutisti. The exhibition at Kunsthal KAdE presents the entire ‘Van Wittel’ story. The places he painted, the style he developed, his Dutch roots, his high-born patrons and his undeniable influence in Italy. With this retrospective, Museum Flehite and Kunsthal KAdE want to give Caspar van Wittel – Gaspare Vanvitelli – his place in the canon of Dutch art history as maestro of the Italian cityscape. Caspar van Wittel, View of Amersfoort, ca. 1712, gouache on vellum on panel, 27,5 x 48 cm, Museum Flehite, Amersfoort. Purchased with support from the Vereniging Rembrandt (also thanks to its BankGiro Lottery Purchasing Fund, its Utrecht & Gooi Cirkel and Theme Fund Prints and Drawings), VSBfonds, K.F. Hein Fonds, Municipality of Amersfoort, Oudheidkundige Vereniging Flehite, Fonds Bos, Stichting Vrienden van Caspar van Wittel, Museum Flehite and twenty Amersfoort residents. As part of the exhibition, Rotterdam photographer Hans Wilschut was asked to follow in Van Wittel's footsteps and capture a number of the places in Rome, Naples, Venice and Amersfoort that Van Wittel frequently painted. Hans Wilschut is also featured in the exhibition ''Stadsbeelden'' (cityscapes) at Museum Flehite, from 9 February through 19 May. Caspar van Wittel was a student of Matthias Withoos, who had trained at Jacob van Campen's painting school at the Randenbroek country estate in Amersfoort. 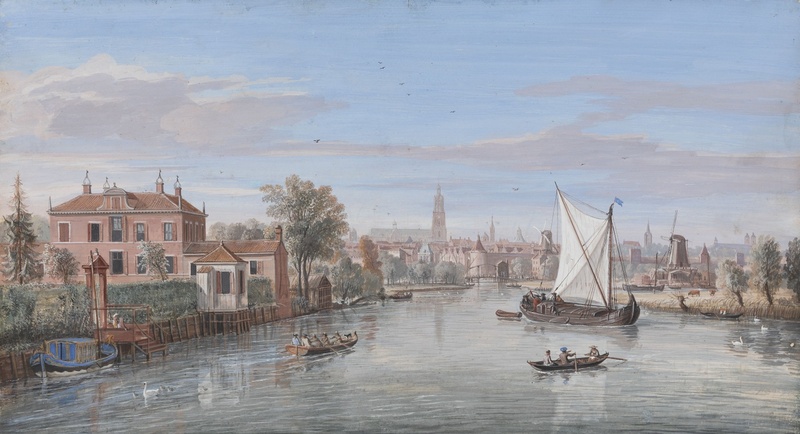 Withoos' masterpiece is his View of Amersfoort: commissioned in 1671 by the city government at the time, it was painted in the time that Van Wittel was training with him and therefore it is possible that the young student – he was 16 or 17 years old at the time – worked on it. Van Wittel relocated to Hoorn with Withoos in 1672. As a result of the move, he was neighbours with the painters Jan van der Heyden and Gerrit Berckheyde, who had developed a ‘pure’ rendering of the cityscape in Amsterdam and Haarlem. This ‘Dutch’ way of painting is conveyed in Van Wittel's work. Accompanied by a fellow young painter – Jacob van Staverden – Van Wittel travelled to Rome sometime around 1673. In Rome, he found himself in the Dutch Schildersbent (‘painters' clique’) faction of the Bentvueghels (‘birds of a feather’), a group that had been an artists' colony for decades in the eternal city. In Rome, he became acquainted with the work of Lieven Cruyl and Abraham Genoels, who made topographic drawings of the city. He also met Cornelis Meyer, a mechanical engineer who was striving to land an assignment from the Pope to build water works along the Tiber. Meyer asked the young Caspar – now in his mid-20s – to help with the illustrations for the manuscript. 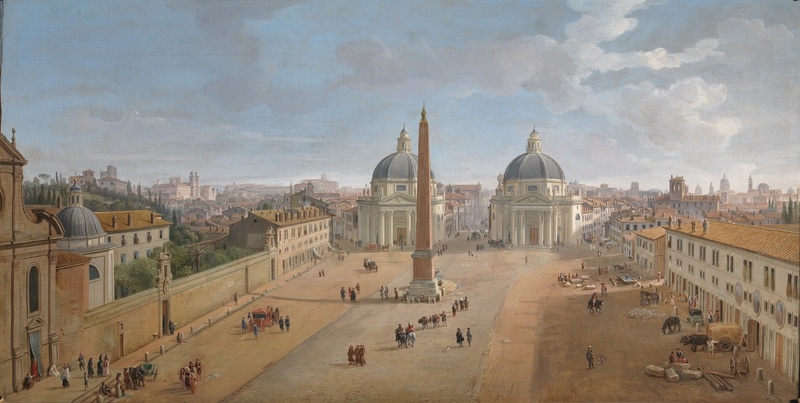 One of the subjects that Van Wittel drew was Piazza del Popolo, the square where Van Wittel arrived in Rome from the north. Ultimately, he would paint this square some 15 times in his career, always from the same perspective. From that moment (around 1680), Van Wittel also began capturing other places in Rome with his signature precision: the Tiber with its bridges and the Castel Sant'Angelo on the banks, the Piazza Navona, the Colosseum, St. Peter's Square, the Quirinal, Villa Borghese, churches, streets and smaller squares. He often repeated these compositions numerous times, too, working from a single basic drawing. From Rome he travelled to Naples, the countryside surrounding Rome (Tivoli), Florence and Venice. In the lagoon city of Venice, he captured the view of San Marco and the Doge's Palace from the water. He painted the majestic La Salute church at the entrance to the Grand Canal. Nowadays it belongs to the standard repertoire of Venetian cityscape painting, but Van Wittel was the first to paint it. Around 1719, the young Venetian painter Antonio Canal was in Rome to paint several decorative pieces with his father. It is highly likely that he met Van Wittel during this time and saw a number of his Venetian cityscapes. Filled with inspiration, Canal, who would quickly be called Canaletto, dedicated himself entirely to this subject. At the time, the Grand Tour - an ‘educational trip’ for young members of the nobility - became incredibly popular and Canaletto, together with his cousin Bernardo Bellotto, became the go-to painters of Venetian cityscapes that were snapped up by the travellers. Incidentally, Van Wittel led the way here, too; he had provided Grand Tour travellers – including Thomas Coke – with these sorts of ‘picture postcards’. Upon his return to England, Coke built Holkham Hall in the north of Norfolk, which was inspired in part by his travels in Italy and the work of architect Palladio. Once he arrived in Rome, Van Wittel established an extensive network of patrons that included not only Roman aristocracy such as the Sacchetti and Colonna families – in whose palaces he took up residence from time to time – but also the Spanish nobleman Medinaceli, who lived in Rome as an ambassador, became the viceroy of Naples in 1696 and commissioned a total of 35 paintings by Van Wittel, most of which were views of Naples and around the city. As part of the exhibition, Rotterdam photographer Hans Wilschut was asked to follow in Van Wittel's footsteps and capture a number of the places in Rome, Naples, Venice and Amersfoort that Van Wittel frequently painted. Some of these places have remained essentially the same; some have been completely transformed. Just as Van Wittel liked to capture the urban hustle and bustle in his cityscapes at the time, Wilschut shows people today in the iconic settings. Hans Wilschut is also featured in the exhibition''Stadsbeelden'' (cityscapes) at Museum Flehite, from 9 February through 19 May 2019. Click here for an article concerning the project of Hans Wilschut from the catalogue of the exhibition. The exhibition presents around 45 paintings and gouaches and approximately 30 drawings by Van Wittel from Italian, English, Spanish, German and French collections. In addition, there are about 30 paintings and drawings by Dutch and Italian masters. An events programme to accompany the exhibition will be organised in cooperation with the Friends of Caspar van Wittel Foundation. Bekking & Blitz will publish an exhibition catalogue in Dutch and English. This is the first time that a monograph on the artist will be available in these languages. The catalogue costs €29,95,-. The exhibition MAESTRO VAN WITTEL – Dutch master of the Italian cityscape is made possible by the generous support of the Turing Foundation, the Mondriaan Fund, Fonds 21, the Municipality of Amersfoort, the Cultural Heritage Agency and the Province of Utrecht.